LONDON, June 8, 2010 — The top defense lead­ers of the Unit­ed States and Great Britain today dis­cussed how to obtain the mil­i­tary equip­ment and capa­bil­i­ties their coun­tries need when fund­ing is hard­er to come by. 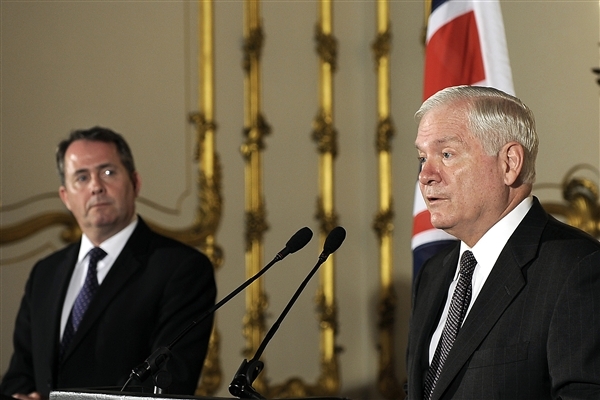 U.S. Defense Sec­re­tary Robert M. Gates, right, speaks at a press con­fer­ence at the Lan­cast­er House in Lon­don, June 8, 2010, while British Defense Sec­re­tary Liam Fox looks on. U.S. Defense Sec­re­tary Robert M. Gates and British Defense Sec­re­tary Liam Fox touched on a vari­ety of top­ics in a meet­ing today, they said at a news con­fer­ence after­ward, and cop­ing with a dan­ger­ous world amid eco­nom­ic con­straints was one of them. Gates said the U.S. mil­i­tary is grap­pling with sim­i­lar issues in an era of fis­cal aus­ter­i­ty that’s occur­ring in the face of an evolv­ing strate­gic land­scape. “I said a while ago that the Unit­ed States can­not have a strong mil­i­tary with­out a strong econ­o­my,” he said. “That’s true of every coun­try. … One way we’re try­ing to deal with what we expect to be extreme­ly lim­it­ed growth in the Amer­i­can defense bud­get going for­ward is take a very hard look at how we spend our mon­ey, and to make sure that we’re spend­ing it on those things that give us actu­al mil­i­tary capa­bil­i­ties, both now and in the future. That requires a hard look at how the depart­ment is spend­ing mon­ey in areas oth­er than force struc­ture and invest­ment in mod­ern­iza­tion, Gates said. He added that he hopes NATO allies deal­ing with the same prob­lem will take a hard look at over­head reduc­tion and busi­ness prac­tices before con­sid­er­ing reduc­tions in force struc­tures and capa­bil­i­ties. Fox not­ed that the British mil­i­tary is begin­ning a defense and secu­ri­ty review that will involve, in part, com­ing to a real­is­tic assess­ment of how much it can rea­son­ably afford, based on the country’s antic­i­pat­ed secu­ri­ty require­ments and the threats it faces.